Gem City is a dog training club open to all members of the community. We are totally a volunteer organization. We support many dog rescue organizations and hold events for all dog breeds - purebred and mixed breed. To encourage rescue we provide certificates for one-half off the first class taken when a dog is adopted. Our main training facility is located at 4920 Northcutt Place, Dayton OH 45415. We also own 10 acres of land off Brandt Pike (Route 201) just north of Stanley Ave., which is fully fenced and groomed. At “The Land" we hold Earth dog tests, Barn Hunt trials, Lure Coursing Aptitude tests,and offer members the opportunity to exercise their dogs. Obedience classes from puppy to advanced are offered to the public at our training facility where we train the handler so his or her dog can be a better family pet and companion. We stress positive training techniques and encourage training rescue dogs as well as mixed breed and purebred dogs. We teach responsible dog ownership and safety, and help handlers develop well mannered dogs. Our aim is to strengthen the human animal bond and reduce pet abandonment and overpopulation. Gem City holds five seven-week sessions throughout the year, at a very reasonable cost for each session. These classes include Obedience from Puppy through Utility (including Canine Good Citizen); Rally (both AKC and UKC levels); Freestyle (dancing with your dog); Conformation (beginner and advanced); Barn Hunt; and Agility (Foundation to Advanced). A total of approximately 30 classes per week are offered, all taught by qualified, volunteer instructors. 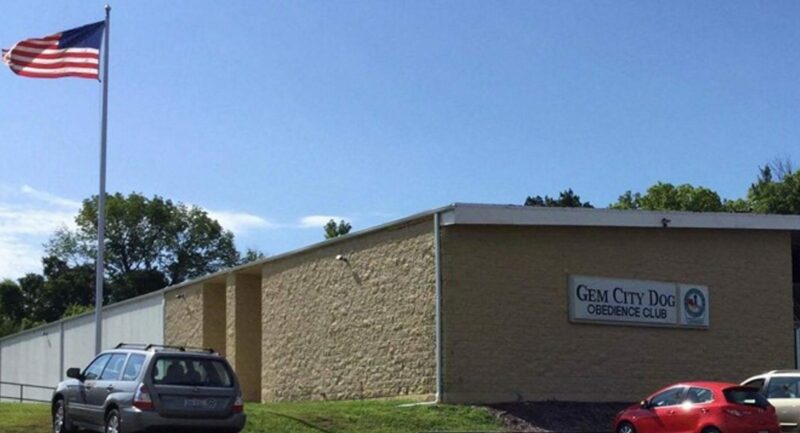 Individuals are required to complete two classes at Gem City before applying for membership. There is a minimum requirement to contribute 10 hours of service to the club annually, and classes are then half-price. There are many opportunities to earn vouchers for free classes with additional hours contributed. Any person who is training a service dog may take introductory obedience classes with that dog at membership price. Groups that train at Gem City include Canine Companions for Independence (CCI) and 4 Paws for Ability. Discounts for one beginner training class are given to newly adopted rescue dogs and puppies. We support the Greater Dayton Humane Society by encouraging our members to participate in their Annual Furry Scurry event. We offer auction support (free class certificates and advertising) for their annual fundraiser, Pet-A-Flair, and occasionally hold a raffle to raise funds for them. As many as 100 dogs and owners are represented annually in the Dayton Children’s Christmas Parade on the Friday following Thanksgiving. Canine Cadence is an obedience based handler & dog drill team made up of members and their dogs. This group performs at several dog events and festivals during the warm weather months, and represents Gem City as good will ambassadors. Gem City provides our building at no cost to various 4-H clubs in the area for meetings and an annual invitational day. Two certificates for a year of classes are donated for the Think TVChannel 14/16 Public Television auction each year. We supported one of our members in raising funds for cooling vests, doggles, mutluks (foot protectors) water bowls and toys for Military Working Dogs. Nearly $10,000 was raised for this cause.. This charity has now outfitted over 300 dogs in Iraq and Afghanistan at a cost of over $300 per dog.